So what is an architrave? An architrave is a form of interior moulding that features in most households, workplaces and recreational buildings. Essentially, an architrave is a strip of material that encompasses the walls and doors. While architrave is the correct term, it can be also called the door casing, surround and frame. The archive is simply an embellishment of the door. 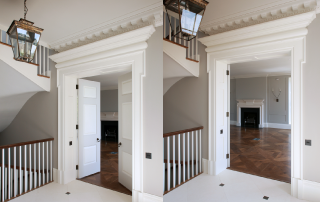 Detailed architrave can add that finishing touch to any room, archives can also be made to match the mouldings of the door to give a collective look. At trunk we are happy to help with any questions, view our architrave collection to see the full range.